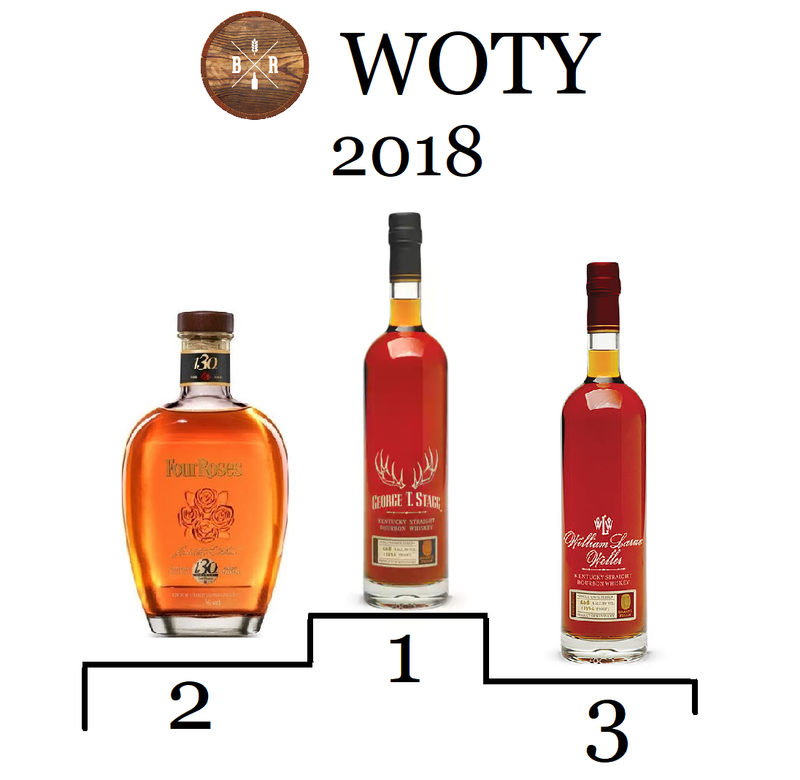 The 2018 Bourbonr Whiskey of the Year vote is in! 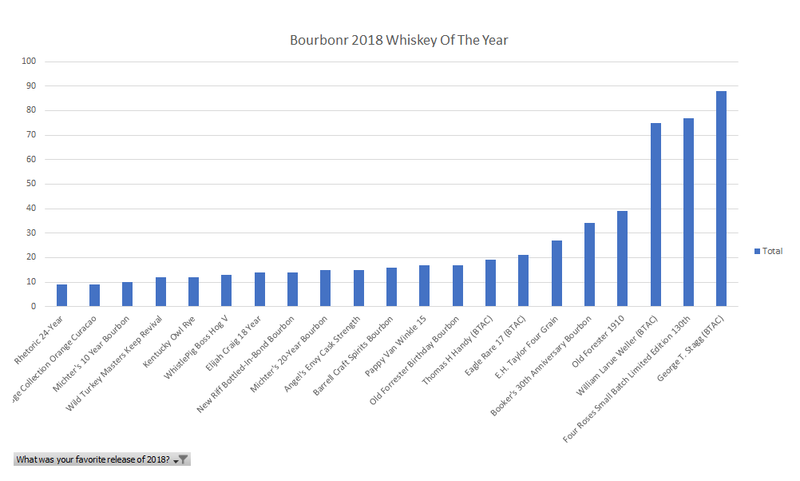 For the past few years, Bourbonr has crowdsourced the Whiskey of the Year selection. I’ll still add my favorite whiskey but this is about the whiskey you loved. Plus, I disagree with most books/sites for “Whiskey of the Year”. George T Stagg is the 2018 Bourbonr Whiskey Of The Year! This marks three years in a row William LaRue Weller is in the Top 3. The Buffalo Trace Antique collection and Four Roses continue to dominate the top 3. But, it’s hard to argue when they continue to pump out great bourbon. Don’t get me wrong, I love BTAC and Four Roses. But, my vote in 2018 when to different bottles. 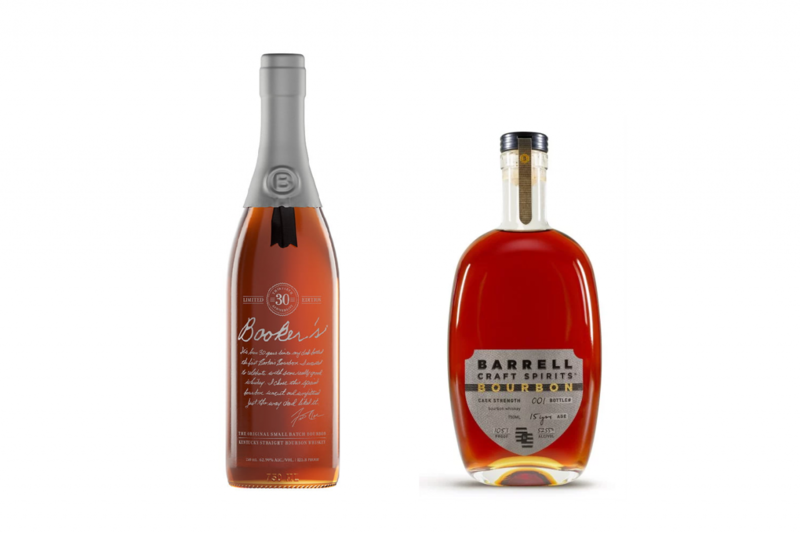 The best bourbon I tasted all year from Booker’s 30th and Barrell Craft Bourbon 15-Year. Booker’s 30th hit all of the right notes to me. It was syrupy sweet with notes of dark cherry and apricots. The Barrell 15-year was a different animal altogether. It was heavy baking spice, brown sugar and clove. These were special bourbon’s and I didn’t want to leave them off of this post. Given this, then my take is that OF 1910 is really the whiskey of the year. Most of the other contenders in the top 10 aren’t generally available to the masses, whereas 1910 was available in most markets as standard shelf stock for many months. Between OF 1910 and the recent release of OF Rye, I’m happy to perch myself on the Brown Forman bandwagon and the Old Forester brand that caters to the everyman of bourbon. Dead on Matt. As I look at the top 20, I might see 1 or 2 of those in the VA liquor stores and even then it’s pretty rare. If I go to Washington DC I can usually hunt down probably 25% of those bottles at my fav store in Capitol Hill….but it won’t be cheap. Preach it, Matt! Not only am I a fan of both, availability of the whiskeys that usually win makes “top pick” almost irrelevant to the masses. But in support of Blake’s findings, no one expects a Chevy Malibu to win car of the year because it’s widely available and affordable. They expect the height of automotive engineering expressed in this year’s model, and that ain’t Chevy. Stagg is a Porsche in this crowd. Perhaps there’s a way to break down the rankings that reflects bottles the general public has a good shot at getting, something like “Whiskey of the Year $35-$55.” Regardless, thanks for the info, Blake. Always entertaining. It’s about time someone starts making an effort to get the snobbery out of Bourbon drinking! I see that my personal favorite EH Taylor Four Grain came in a distant 6th. I would just like to say that in over 50 years, I have never tasted another Bourbon as good as EH Taylor Four Grain. I t is a great dissapointment to me that it is not currently available. OF 1920 is the best bang for my buck. A delicious bottled at the right proofage. And what about EC barrel proof? The b19 is a great sip. 1920 came out a couple years ago, hence not on this year’s list. Matt, I was thinking similar. Havent tried the 1910 yet although I didn’t care for Statesmen or 1920. But what I agree with is that the top 3 are not available to us common folk. I entered the ohio BTAC and Pappy lotto and wasn’t successful. 55000 entries for something like 400 bottles, not good odds. One of my local restaraunts got a bottle of Stagg this year but they value it at $40 a shot! No thanks. For a while I could find McKenna 10 around here easily, but since it won a prestigious award it’s an endangered species on the shelves. My tops for the year based on what’s on shelves would be Russells Reserve 10, Makers 46, and Eagle Rare when I can get it. Agree with other comments that BTAC products are in a category of their own – unavailable. Their distribution makes them unavailable to all but the very select sellers who control their sale to their very select buyers. Therefore, they shouldn’t be in a survey like this, in my opinion. This is funny for me as I picked the WLW first and Stagg #2. PVW 20 year was #3. All bourbons that are basically unattainable, except for the Rick or hooked up. I’d rather see best attainable bourbons. Wood have more reality. This is stupid. Should be named best bourbon to enjoy while on your private jet or 150 foot yacht. Sheesh! If I’m being honest – and I am – as much as I’ve enjoyed the pours I’ve been able to have from the BTAC collection, GTS being a favorite and not far off from THH and WLW in that class, it’s easy to be a bit of a hater! That stems from pure jealously and the inability to easily obtain these bottles. Many who I know that have them are regular guys. Some have lucked into bottles through lottery or timing and others have done it through relationships. Others may have had trade-worthy collections that have parleyed their finds into rarer bottles, trading multiples for singles. Most have burned a lot of calories and a lot of dollars getting there! Good on ’em! I applaud their success – and I can still be a little jelly! Thankfully most are generous souls who do enjoy sharing the fruits of their efforts because it’s really the best way to drink great whiskey – with good friends. Matt R, I’m with you – I do enjoy the success of certain bottles available to the more common man! They keep me grounded and remind me there’s always something good on the shelf wherever I go. Spot on comments. I’ve spent a lot of time and money building a collection and enjoy trading around and up to get what I want. There’s no greater joy than sharing prized bottles with friends and loved ones. I’m a little befuddled by some of the comments made earlier. Snobbery? There is something to fit every palate. Don’t hate because you can’t easily find the expensive stuff. Drink what you like and it’s unnecessary to berate the tastes of others. If someone is mixing Bourbon with anything, use whatever is on the bottom shelf. If you want something, make it a priority to find it. Almost everything can be had at a price. Don’t want to pay the price? Move along. Blake/Bourbonr: isn’t your personal “choice” for Whiskey of the Year a cop out? You can’t vote for 2 whiskies! You don’t let us do that in the voting, so you can’t do that either! Come on, which one gets your vote, is it Booker’s 30th or Barrell Craft Spirits 15yr? Make a decision please. I amazed the 5-18 Elijah Craig Barrel Proof didn’t even garner 10 votes to even get a mention or a look. What really surprised me is the Michter’s 20yr got 12 to 15 votes, if I’m reading the bar chart correctly. Did 12 to 15 people open a bottle that sells for $2k+ or did they all get their bottles at $700 or did they all drink from the same bottle? I find myself more and more apprehensive to open some of the bottles I own, at sane levels, which nowadays people are paying $1k+ for. I for one, can only taste these expensive bourbons, even if I own them, at a bar where they charge a ludicrous but market price of $100 per glass. If my math is correct a bottle has 750ml. A 1/15th airline bottle is 50ml so each mini equivalent is $100+ ! That’s absolutely nuts! When I can trade one bottle for 10 to 12 bottles of of perfectly fine Knob 125th or some of the Booker’s BBQ , Oven Buster, or Chew not omitting the ECBP’s, it is a no brainer. There is so much excellent bourbon out there from the real Kentucky producers, why buy these new labels with their spun stories of history and long lost distilleries and distant relatives? I try to keep my wits about me and not buy into this chicanery and hope some of you will as well! There are plenty of bourbons in the $50 to $100 range which you can truly enjoy with a steak and kill the bottle and have no tears whatsoever.